The Calgary Flames have acquired veteran goalie Mike Smith from the Arizona Coyotes in exchange for prospect Brandon Hickey, goalie Chad Johnson and a conditional third-round pick. "I'll be thrilled to pull that sweater on for the first time," said Smith. "To be a Calgary Flame...it sounds kind of surreal right now. I'll do everything in my power to help this team succeed." TSN Hockey Insider Bob McKenzie says Arizona will retain 25 per cent of Smith's salary in the deal. The third-round pick will become a second rounder if the Flames make the playoffs next season, according to TSN Hockey Insider Pierre LeBrun. Smith has two years left on his current contract with an average annual value of $5.66 million. Smith, 35, started 55 games for the Coyotes in 2016-2017, posting a record of 19-26-9 with a 2.92 goals against average and .914 save percentage. The Kingston, ON native has two years remaining on the six-year, $34 million contract he signed in the 2013 offseason. 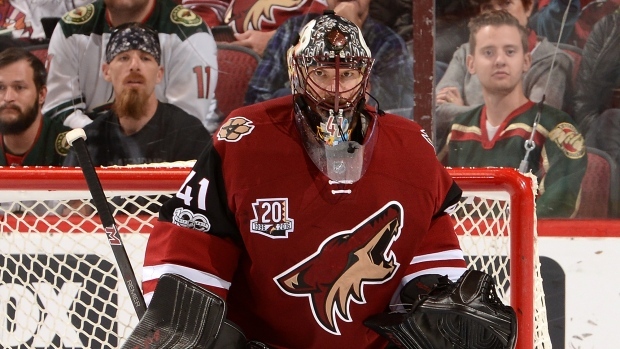 He has spent the past five seasons with the Coyotes, and has also played for the Tampa Bay Lightning and Dallas Stars. The Stars drafted the 12-year veteran in the fifth round (161st overall) of the 2001 NHL Entry Draft. Johnson will be an unrestricted free agent on July 1. The 31-year-old saw 36 games with the Flames last season, posting a 18-15-1 record with a 2.59 goals against-average and .910 save percentage. Hickey, a 21-year-old defenceman, scored four goals and added 11 assists over 35 games with Boston University last season.